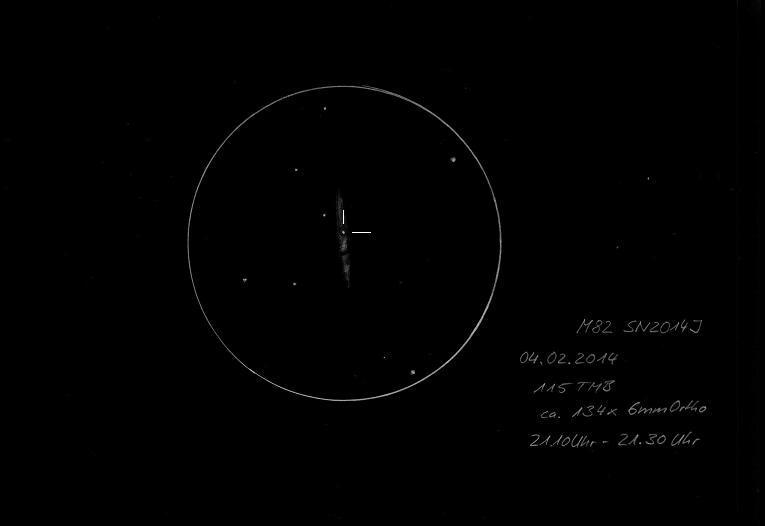 Two and a half hours of clear sky at 04.Februar 2014 were sufficient to hold the SN in M82 and take a long walk on the winter night sky. After a tough cloud cover and then the mist had dissolved about 21:00 clock, I could start the observation with the TMB 115/805 Apo. The supernova was a really great thing! Very bright and striking beamed the SN in the “cigar”. After a brief enjoyment, I started with the sketch! Unfortunately, the review was only mediocre, so blurred finer structures of the galaxy almost. Nice to see was the interruption in M 82 and south two light specks.